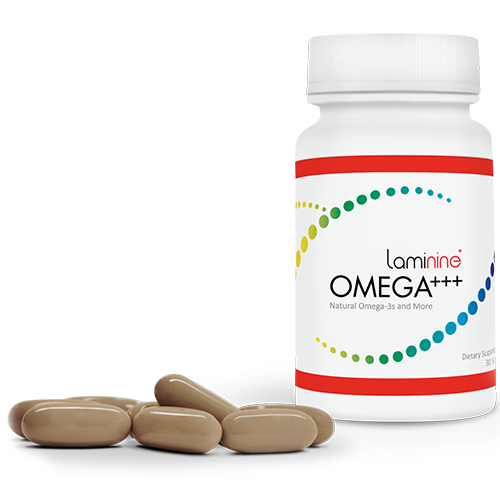 Laminine Omega+++ is the ideal supplement for men and women, 40 years old and above. Those who have heart or bone concerns, including those with inflammatory issues such as prostate, or other forms of inflammation, cholesterol, blood-related problems, and cardiovascular diseases. For those not familiar with these fatty acids, it doesn’t make sense to add fat in our body to heal itself. Fatty Acids are like the “good fats” while fats found in red meat would be the “bad fats”. There’s always two sides of the story, much like Night & Day, Yin & Yang, or Good Cholesterol & Bad Cholesterol. 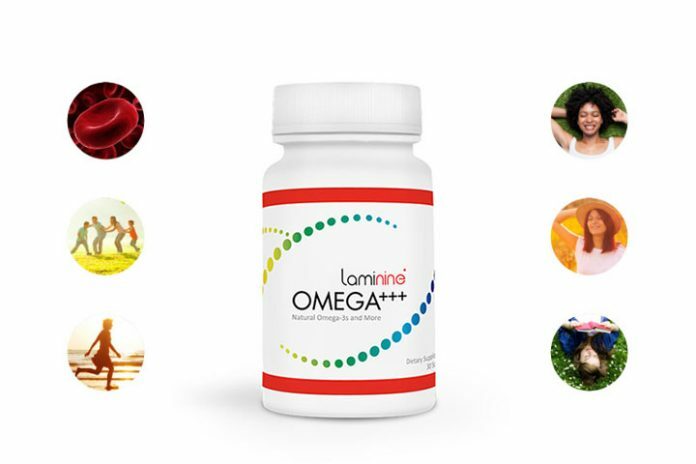 The Fatty Acids in Laminine Omega+++ comes from small fishes that lay at the bottom of the Low-density Fatty Acids maintain the normal levels of high-density Lipoprotein (HDL) or “good” cholesterol, and low-density Lipoprotein (LDL), or “bad” cholesterol. DHA is found in gray matter in the brain and Omega-3 partially converts to EPA and DHA in the body. It is responsible for sending accruing and timely brain signals throughout the body. EPA also converts to DHA as needed by our body. Unlike others food supplements, Laminine Omega uses a Peruvian fish – “Engraulis Ringens”, which is a member of the anchovy family. Also known as Peruvian Anchoveta, this fish is sourced from the “Humboldt Current”, off the coast of South America near Peru. Fatty acids from this type of fish have the highest naturally-occurring ratios of EPA and DHA of any “.sh” species. Upon harvest, Engraulis Ringens undergoes molecular distillation to remove gunk, toxins, and contaminants. It is further tested and screened to give you the best quality Omega Fatty Acids. Studies have shown that EPA & DHA are important for proper fetal development, including neuronal, retinal, & immune function. It may affect several aspects of cardiovascular functions and peripheral artery disease. – Advances in Nutrition, An International Review Journal. Engraulis Ringens The Fatty Acids from this type of fish has the the highest naturally-occurring ratios of EPA and DHA. Sourced from the Humboldt Current, which is known to have a deep cold, low-salinity ocean current that flows north along the west coast of South America to northern Peru. Omega 6 plays a role in cell signaling of the brain. Studies show its positive impact on helping to balance cholesterol levels. Omega-9 is considered as non-essential because of the body’s own ability to produce Omega-9 in small amounts, but a supplement may still be in need for those who have undergone poor nutrition. Having a poor nutrition does not equate to malnutrition, but those who have lingering diseases or inability to absorb nutrients will have poor nutrition. Borage is a plant with leaves and flowers. They are traditionally known to treat skin disorders including eczema & dermatitis. It is also used for other sickness such as rheumatoid arthritis (RA), stress, premenstrual syndrome (PMS), diabetes, attention deficit-hyperactivity disorder (ADHD), acute respiratory distress syndrome (ARDS), alcoholism, pain and swelling (inflammation), and for preventing heart disease and stroke. Borage is also used for a hormone problem called adrenal insufficiency, for “blood purification,” to increase urine flow, to prevent inflammation of the lungs, as a sedative, and to promote sweating. Borage Oil unlike other food supplement that contains Omega 3-6-9, Laminine uses Borage oil sourced from the Mediterranean area. It aids swelling & inflammation) and for preventing heart disease and stroke. In foods, Borage can be used and eaten in salads and soups. 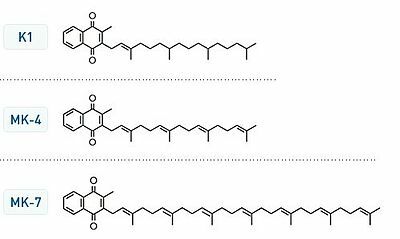 This oil-soluble, vitamin-like substance is present in most cells. Human organs with the highest energy requirements—such as the heart, liver and kidney—have the highest CoQ10 concentrations. The Extended Release or ER capsule in Laminine ensures that the compound stays in the body up to 24 hours. The effect is enough to last the whole day, until your body rest. This means that your body can get enough protection from damaging particles known as “Free Radicals”. These particles are everywhere, from the offices, exposures to appliances, pollution, and food. Free Radicals damages the cell membranes, tamper with DNA, and even cause cell death. Your body needs protection or an antioxidant, and Laminine Omega+++ can provide 24-hour protection. CoQ10 CoQ10 comes from fish & red meat, Coenzyme Q10 (CoQ10) is a nutrient that occurs naturally in the body as well as from foods we eat. There are 2 basic types of Vitamin K – K1 and K2 and Laminine Omega has K2. Vitamin K2 comes from a form of food bacteria. MK-4 and MK-7 are the two most significant forms of K2 and act very differently in your body. Laminine Omega contains the MK-7 which is recognized as the most nutritious chain. Vitamin K2 helps to direct calcium to the bone and teeth, where it belongs, keeping the calcium from attaching itself to the arteries. Vitamin K2 helps to direct calcium to the bones and teeth, where it belongs, keeping the calcium from attaching itself to the arteries. K2 goes straight to vessel walls, bones, and tissues other than your liver. It is by far the richest source of K2. K2 goes straight to vessel walls, bones, and tissues other than your liver. It is by far the richest source of K2. Vitamin K1 (found in green leafy vegetables) makes up about 90% of the vitamin K, unlike K1, Vitamin K2 does not come from plants but from various types of bacteria. Natto produces this type of bacteria known as Bacillus subtilis. Natto is made from fermented soybeans, traditionally eaten at breakfast. It is known in Japan to provide to ward of cancer, promote strong bones, and prevent senility. Natto is a powerhouse source of K vitamins, particularly K2 (rare in other foods). This fermented soy beans naturally produces “Natto Bacillus subtilis”, which is a bacteria naturally found in the human lower intestine. Nattō is an important ingredient in Laminine Omega tastes bitter with a powerful pungent smell and slimy texture. It’s favorite Japanese dish. Nattō contains large amounts of vitamin K2 and regular intake helps the formation of calcium-binding groups, assisting the formation of bone and preventing osteoporosis. Nattō also reduces the likelihood of blood clotting through an enzyme it produces called nattokinase. A 2009 study in Taiwan indicated that the “nattokinase” in natto has the ability to degrade “Amyloid Fibrils”, suggesting that it might be a preventative or a treatment for amyloid-type diseases such as Alzheimer’s. Found in Laminine (Original), this egg extract from a 9-day old avian egg stimulates stem cells allowing each of the other ingredients in Laminine OMEGA+++ to perform their function effectively. This ingredient comes in powdered form also known as PESE or photo embryonic stage extract which was first discovered by Dr. John Ralston Davidson, a Canadian doctor who was looking for a cancer cure. He theorized that the nutrition found on exactly the ninth day of an egg contains micro nutrients that can help the body heal itself. The research died with him. Some 50 years later, Dr. Bjodne Eskeland, an egg researched from Norway did further research on the extract. He patented the powder form and called it YTE or Young Tissue Extract. Effects of OPT9 in the body is well documented in clinical research and trials. Several double blind placebo control tests were done and with testimonials and testimonies, from around the world. Other Ingredients: Gelatin, Glycerin, Beeswax, Purified Water, Soy Lecithin, Phosphatidylcholine Soy Lecithin, Titanium Dioxide, Caramel Color. how to buy? i want subscribe to. the child is 4 years old and has epilepsy, i was told. To buy Laminine, click ‘Buy Laminine’ choose your country. For children with epilepsy, you can give 1 capsule (per day) Laminine (original not omega) 30 minutes before breakfast. After reading your extensive coverage on the subject of Laminine ,i am convinced to try it ,not just out of curiousity but based on the information that has been given ,i am so anxious to get on this new experience ,i will be calling on your agents in Trinidad & Tobago to furnish me with this product,thanks to healthy living . Great to hear, you can call Linda Hoyte at 1868-477-1160 for Trinidad & Tobago independent distributor. Does the Laminine Omega have less protein powder than regular Laminine? Dear Sirs, As I have not been able to find in the literature the information I am interested in, I address you. I started using Laminine Omega+++ but my tablets are too big for me to swallow. Is the alowed tablet and how to crush up without damaging the usefulness of the ingredients. LifePharm Omega cannot really be sliced/split because of it is liquid inside. What you can do for Omega is just to slice it open in a spoon, and squeeze out the oil and take it. The potency will not change, it will still be effective. The capsule/case can be discarded.